For those who haven’t heard, tomorrow marks the next big announcement from Apple about the iPhone. There are many expectations for what we will see. It is almost certain the iPhone 5 will be shown and possibly a new iPhone 4S, though reports on that are conflicting. 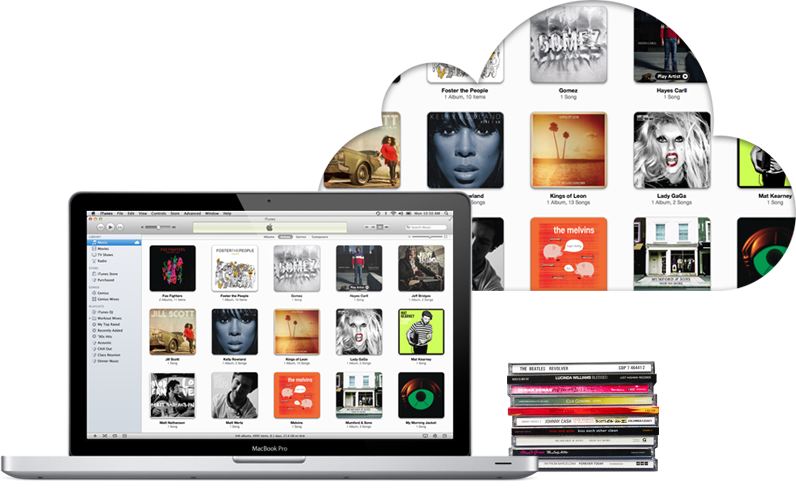 What is also widely suspected is that tomorrow will be the official launch of iTunes Match, the new Apple service that will store your entire music collection (whether you bought the songs from iTunes or not) and give you access across all your computers and devices for $24.99 per year. iTunes scans your music and matches it with the 20 million songs in the iTunes Store -- and automatically stores it in your iCloud Library. That’s a pretty big deal. Not only does that give you legitimate copies of songs you may have obtained from Napster, BitTorrent, a friend, what-have-you, but it also means you don’t have to shell out big bucks for the largest hard drive inside of the device just to access songs you rarely listen to anyway. Coming from the biggest retailer of music, that’s a really big deal. In fact, some might say it is a game-changer… But is it? Yes. Any time a company that makes consuming media as easy as Apple does makes an offering like this, it sets the standard. People will hear about it. They will understand it. They will use it. The short answer (as I always promise to get to right away): No, iTunes Match isn’t worth $24.99 per year today; there are too many other services with great features at competitive prices, but stay tuned as that could change. iTunes Match is sure to be a good service, and at roughly $2.00 a month, you can’t go wrong, but there are other, better services that offer you more that are worth using instead. Principally, if you use an Android phone, you’re going to want a different solution. The problem is there are so many, it is tough to know where to begin. I’ll provide the breakdown. Apple does something I’ve not seen them do before, and actually compares its upcoming offering to those of Amazon and Google, so let’s start there. Amazon’s offering (actually a pairing of Amazon MP3, Amazon’s Cloud Drive Music Service and Amazon Cloud Player) has been available for a while. Right now, they are offering unlimited storage under any paid plan or for having taken advantage of some special offers around the launch, and they’re accessible from any computer as well as Android and your iPhone/iPad (via an HTML5 site you access from Safari, rather than a native app, which isn’t a big obstacle). Also, like iTunes Match, anything you purchase directly from the Amazon store becomes immediately available in your account, and Amazon pricing is often $0.10 less per song and up to a dollar less for an album, so that’s a plus. At first blush, this is a great option, but that free service is set to expire. Amazon has already published their pricing plans for when it does, and as Apple points out, it will be more expensive than Match. Also, while having directly purchased songs available immediately is great, most of us have a large collection already on our computers; Amazon’s MP3 Uploader takes weeks or longer to upload large libraries of files to the Amazon Cloud. Moreover, you have to initiate the uploads manually, rather than being able to run a system service to monitor your music folders for changes, so it is non-trivial to keep your Cloud organized. The player experience (especially on Android) is slick, but doesn’t support your old playlists and just generally feels a bit slow. Given last week’s Kindle announcements, and the likelihood that Amazon could do much more with this service in the near future, you can’t rule Amazon out, but if you have an iPhone, you’re going to prefer iTunes Match right now. Google also has a service that allows users to upload their entire libraries to the cloud aptly named Google Music. Unlike iTunes and Amazon, Google doesn’t currently offer a store to purchase new music, but their program is in early beta and they’ve already started making songs available to those who are in the beta program for free with a service they are calling Magnifier. Unlike Amazon, Google has created a system tray service to monitor your music, which can upload new tracks automatically. It is called Google Music Manager, and works well, but also takes weeks to process a large local library. With a 20,000 song cap, you are HIGHLY unlikely to fill up Music Manager, so this comes in at the cheapest solution. Still, the Android app is minimally functional, with no playlist support and really a terrible UI. Given that Google owns Android, I expect new versions to improve on the existing product. Like Amazon, Google has made their web service accessible from Safari on iOS devices, so once again, it allows what iTunes Match doesn’t in promising users with multiple device types ubiquity. Still, until the application is improved, playlists are added, and a store (or other way of accessing songs you don’t already own) is introduced, iTunes Match will still look very good to most of you. So, compared to the services Apple calls out for you, iTunes Match still looks like a good option, but what about the rest of the pack? Slacker Radio is much more than a playlist creating computer that chooses songs that are similar to each other. Our expert DJs hand-pick songs based on their extensive knowledge combined with your personal preferences. Our music library is larger than our leading competitor’s by millions of songs, so you’ll hear all of your favorites and a ton of new music that we know you’ll love! Shoutcast, iHeartRadio, and SiriusXM – These services actually let you listen to radio (or web radio) stations programmed by others and also have nearly ubiquitous availability. With ALL of these services, they’re competitiveness with iTunes Match is almost a philosophical one. If you can listen to great music that you’ll love on any device at any time, is there any reason to OWN a library of music that you need to access directly? These services would argue no. I disagree. I like to call up a specific song or a playlist I’ve built, and even the (really cool) customizations I can make to a Slacker station don’t quite compete with my own list. MOG’s all-you-can-eat, on-demand listening service provides access to a deep library of over 12 million songs and a million albums through its mobile apps on iPhone and Android, as well as on the Web and streaming entertainment devices for TV. It surpasses all other music subscription services in its ease-of-use, discovery features and audio quality. Grooveshark – For $9.00 a month ($1 less than MOG), you can get access to a near limitless collection of the most popular songs ever recorded. You can stream them on the web or access them from your mobile device… the only real differences between MOG and Grooveshark are: (1) Grooveshark gives you the option to take surveys to earn points to pay for the subscription instead of using cash; and (2) MOG was founded with support from the music industry, while Grooveshark has gotten where it is by settling lawsuits and flying under the radar. Beyond that, MOG boasts 12 million songs to Grooveshark’s 15 million, and MOG has a bit more support from TV and other device manufacturers. But, for these all-you-can-listen services, the downside is not about lack of control over what you listen to, but there is a catch… if you decide to stop paying the subscription, you have NO ability to listen the songs and playlists you put together with them. All of the effort that went in to finding what you want to listen to and organizing it, with none of the long-term benefits and VERY high switching costs. It isn’t for me. ensures a high-quality/high-fidelity experience (I haven’t talked about this point as all of these services do a good job on that front once you’re already happy with digital music). So, who fits that bill? Spotify has been the favorite of our friends across the pond for several years now, but they gave all that up to come to the States. Users can register free accounts that are supported by ads (that can be both frequent and jarring) or pay $9.99 a month for no ads, mobile access and the ability to save playlists for offline listening. (Note, for Spotify and other services, I’m skipping cheaper plans that don’t include mobile usage). Rdio only offers a 7-day free trial, after which users must pay the $9.99 a month for access that includes mobile. Both Spotify and Rdio offer desktop applications to listen to just about any song you can think of (15 million + song catalog in each case), and both match your current songs so you can listen to your own collection outside of your home. Neither require you to actually upload the music, so it doesn’t take nearly as long as Amazon’s or Google’s services to get either set up. And, both let you create playlists that you can share (or even collaborate to create) with friends. Rdio focuses a bit more on social interaction and discovery by following what your friends are listening to. Rdio is also available on more platforms. With the ad-supported option to help get users acclimated and the well-thought-out user interfaces, Spotify may just prove to be a better service. Either way, these services do what iTunes Match can’t. They give you access to YOUR library from anywhere, and they let you listen to ANY song you can think of without buying everything you might want to listen to. The extra $7.90 is something you’d likely spend buying extra songs on iTunes you don’t want once you’ve listened a few times. These are both great services and well worth your time and money. I couldn’t finish a post about streaming music without mentioning one of my absolute favorites: newcomer, Turntable.fm. Turntable also lets you listen to a ton of music and leverages community to expose you to new music. On their service, users DJ for rooms of fans. As of this writing, the top 10 rooms housed almost 1000 people. And with the recent launch of an iPhone app, you can experience this on the go. There’s something amazing about listening to someone DJ for you live and doing so in the comfort of your own home where YOU can become the DJ is even better. But, Turntable is fully a synchronous experience. If you show up to a room after everyone has left, there’s no music to listen to. There’s no ability to automatically add all of your own library (you have to search for tracks individually to add them to your playlist) and you wouldn’t necessarily want turntable to replace these other services. Still, if you’re a fan of music, you should definitely check it out. It is free and worth your time.